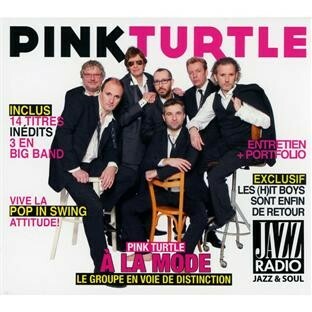 Musique : Pink Turtle "à la mode" 2010. Pink Turtle "à la mode" - 29 juin 2012. 1 Video killed the radio star (The buggles - 7th september 1979). 2 Baker street (Gerry Rafferty - 3rd february 1978). 3 A hard days night ( The Beatles - 10 july 1964). 4 Don't stop (Fleetwood mac - 6th july 1977). 5 Sultans of swing (Dire straits - may 1978). 6 You really got me (The kinks - 4th august 1964). 7 Get up, stand up ( Bob Marley and the Wailers - april 1973). 8 Imagine (John Lennon - 11th october 1971). 9 Give a little bit (Supertramp - may 1977). 10 Day dream (The Wallace collection - 1969). 11 Nothing from nothing (Billy Preston - 1974). 12 You're the one that I want (Grease OST - 1978). 13 Can't take my eyes off you (Frankie Valli - may 1967). 14 Isn't she lovely (Steve Wonder - 1976).